Homeopathty medicines are natural and safe and these do not have any side effects. Homeopathy is an individualized system of medicine that treats the person as a whole by dealing with mental, physical as well as emotional issues. Myth All homoeopathic medicines are same? Fact: It appears that all homoeopathic medicines are same because they are dispensed in globules. Actually in all preparations the vehicle remains the same but it is medicated by different homoeopathic dilutions. You can read here what people think of us or about our services by clicking the link and you can also share your experience with others by posting your views. You can also experience the benefits of homeopathy, just contact us and your problem and identity will never be disclosed. Our team of Homeopathic Doctors involved in this research includes, Gynecologist, Neonatology, Pediatrician, Psychiatrics, Neurologist and Alternative medicine specialists. We are eager to take the nation towards the new horizons of progress in the field of medicine. Dr.Makkar's expert, research based treatments for major diseases. You will find extensive information on clicking the links. 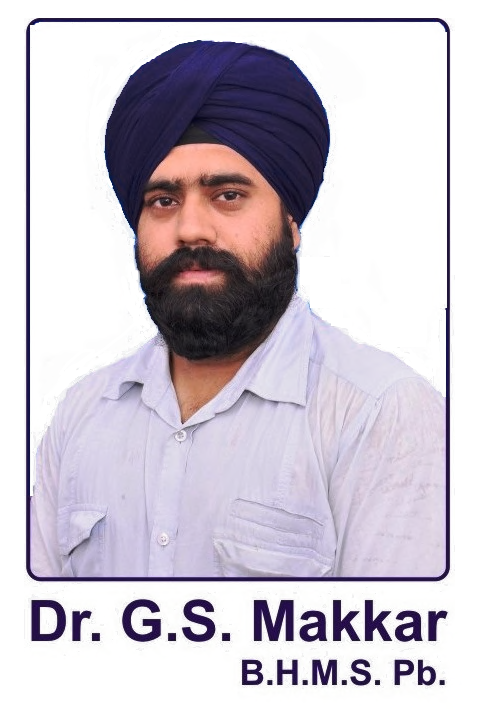 Dr. GURPREET SINGH MAKKAR is a dynamic homeopath from India(pb). He is an ardent student of classical Homeopathy. He is a registered doctor degree holder (B.H.M.S.) from Sri Guru Nanak Dev Homoeopathic medical college(S.G.N.D Barewal Ludhiana,PUNJAB, India. An honest, humble and hardworking physician, he has an experience of treating many patients from India and abroad.His practice is predominantly Neuropsychiatry, Orthopedic, Cardiac, Resp, Genitourinary,sexual problems (male & female) and skin disorders. Dr Gurpreet Singh Makkar offers his patients the most comfortable, modern, and effective treatment available. Perhaps most importantly, Dr.G.S.Makkar takes great pride in providing a warm, comfortable, and caring environment during the process of caring for his patients . If you have any medical questions and any health related problems, please contact us. Dr G.S.Makkar also offers high quality Free online consultaion service. You can call us on +919872735707 or mail to the Dr Gurpreet Singh Makkar on info@askdrmakkar.com for appointments or Online Consultaion & Treatment. Our mission is to provide high quality medical care to all our patients. Please take a few minutes to fill out your feedback about patient satisfaction survey and website content. We thank you for choosing Sukhmani Homoeopathic Multispeciality Clinic. I am offering or providing Health Care to Acute & chronic patients WHO LOOK FOR QUALITY OF MEDICINE NOT FOR QUANTITY OF MEDICINE,WE BELEIVE IN HOLISTIC CONCEPT OF CURE in which disease removed in whole extent Sukhmani Homeopathic Multispeciality Clinic(punjab). WE TREAT MAN IN DISEASE NOT DISEASE IN MAN. This Website provides an insight into the phenomenal and unprecedented success of treating the most difficult diseases of the world including Cancers, Brain Tumors, Thalassemia, Renal Failure, Heart Diseases and other similarly critical diseases using Advanced Homeopathy supported by real life patient information. We have satisfied patients of ONLINE HOMOEOPATHIC TREATMENT in more than 20 countries including USA, UK, The Netherlands, Saudi Arabia, Austria, France, Germany, Holland, Hong Kong, Singapore, Malaysia, Japan, Switzerland, Italy, Poland, Dubai, Saudi Arabia, Australia, Canada, New Zealand, Bahrain, Pakistan, have benefited by our services.list is increasing slow & steadily. We also have satisfied patients of ONLINE HOMOEOPATHIC TREATMENT & CONSULTATION in India States and Capitals of India which includes Jammu & Kashmir, Himachal Pradesh, Punjab, Harayana, Chandigarh, Delhi, Rajasthan, Gujarat, Maharashtra, Goa, Lakshadweep, Karnataka, Kerala, Tamilnadu, Andaman and Nicobar, Pondicherry, Andhra Pradesh, Orissa, West Bengal, Bihar, Madhya Pradesh, Uttar, Sikkim, Assam, Arunachal, Meghalaya, Mizoram, Tirpura, Nagaland, Manipur. We deal with the fields of certain chronic diseases namely, Asthma and Allergy, Cerebral Palsy,Mental retardation, Autism Spectrum Disorder, Pediatric Neurology Disease, Uncommon Genetic Disorder like, Mentally Retarded Children, Down Syndrome, Dyslexia, Oligospermia, Male & Female Infertility, Recurrent Abortions, MDR Tuberculosis, Infective Hepatitis, Height Increase in children,any type food allergy like..wheat allergy,egg allergy,milk allergy.These types of diseases are well treated in our clinic & ONLINE HOMOEOPATHIC CONSULTATION(FREE) AND HOMEOPATHIC TREATMENT. • These research works are aimed at providing best medical solutions to the patients who require medical treatment for these chronic and un diagnosed ailments. • Our team of Homeopathic Doctors( Homeopath )involved in this research includes, Gynecologist, Neonatology, Pediatrician, Psychiatrics, Neurologist and Alternative medicine specialists. • Doctors are constantly into upgrading their research with the latest developments to provide best medical solutions and are keen on making it beneficial to their patients. • We are eager to take the nation towards the new horizons of progress in the field of medicine. We strive to achieve 100% satisfaction through our homeopathic treatment for you. Our regular & stringent quality checks are backed by Dr. Makkar Homeopathy Clinic. Experience scientific & clinically proven Homeopathic treatment protocols. Our Homeopathic treatment protocols offer painless, gentle & permanent cure for you. John D. Rockefeller lived to the ripe old age of 98 and was known to have his homeopath often travel with him. He said that homeopathy is a progressive and aggressive step in medicine. He tells U.S. TV host David Letterman, who also has tinnitus, �For me it started in a delightful way. I used to wake up in the morning and think, �I can hear the birds singing! I�ve never been able to hear the birds singing.� It started with peeps and whistles and beeps so it was very much like birds singing.� �Right now I don�t have it badly. I have done quite a lot of new age medicine stuff to help me. And a homeopathic teacher, or a homeopathic doctor, helped me a lot with this, so I would recommend that. "Homoeopathy is a highly developed health practice that uses a systematic approach to the totality of a person's health. Anyone seeking a fuller understanding of health and healing will find Homoeopathy extremely important and applicable." Gay Gaer Luce PhD (science writer - twice winner of the national science writer's award).